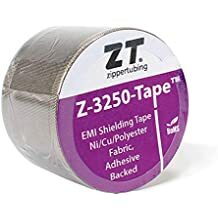 Z Foil - Shielding Tapes And Wraps - Emi Shielding - Products - ZT | Zippertubing Co.
0.25" 0.375" 0.5" 0.625" 0.75" 0.875" 1.0" 1.25" 1.5" 1.75" 2.0" 2.25" 2.5" 2.75" 3.0" 3.25" 3.5" 3.75" 4.0"
Z-Foil® is comprised of an Aluminum foil material with a laminated film of Mylar (Polyester) on one side and a pressure sensitive adhesive closure. You’ll find Z-Foil® very useful in high-frequency EMI/RFI shielding applications where an economical, lightweight, low-profile shielding is wanted and re-entry is not needed. The SH1 Aluminum foil material is excellent as a general-purpose shielding product in areas such as an electronics rack. This product should not be used where a great deal of flexing may occur. Z-Foil® is great for both round and flat cable shielding requirements and is available with or without a tin/copper ground wire. This product is flame retardant, and has an operational temperature range of -45° to 150°C (-49° to 302°F). Cable Diameter 0.25" 0.375" 0.5" 0.625" 0.75" 0.875" 1.0" 1.25" 1.5" 1.75" 2.0" 2.25" 2.5" 2.75" 3.0" 3.25" 3.5" 3.75" 4.0"
A thin high temperature Acrylic transfer adhesive used to create permanent jacket closures on flexible low surface energy plastic materials. This specially formulated transfer adhesive and is intended for use on flexible Polyurethane films and other LSE materials even when exposed to high temperatures. 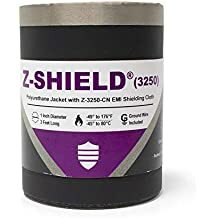 When properly sealed together this adhesive creates a strong permanent bond that cannot be reopened (after several weeks) without structurally damaging the base material. Attempting to remove and reset this adhesive after initial placement will destroy the strength of the material.